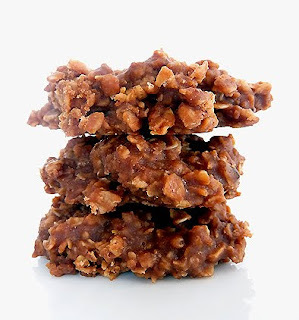 My family adores these cookies, especially when we are in the mood for some chocolate, when we don't have enough time to bake cookies, we make No Bake Cookies! The picture drew me in! It looks divine, haven't tried it, but believe me - I will! 1) Preheat the oven to 350°F. Lightly grease and flour (or grease, then line with parchment, then grease again) two 8" x 2" round cake pans. Note: These pans need to be at least 2" tall; if you have non-standard, shorter 8" pans, substitute 9" round pans. 2) To make the cake: Whisk together the dry ingredients. Add the eggs, oil, and vanilla, beating until smooth. 3) Gradually add the water, beating until smooth. 4) Pour the batter into the prepared pans. 5) Bake the cakes for 35 to 38 minutes (a bit less if you use a 9" pan), or until a cake tester inserted into the center comes out clean. Cool the cakes in the pan for 15 minutes, then turn them out of the pans to cool completely on a rack. 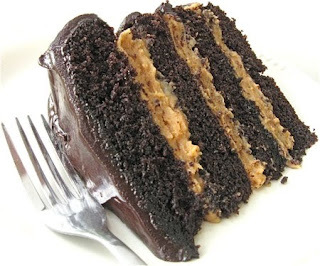 6) To make the filling: Mix the sugar, peanut butter and vanilla till crumbly. Add the milk and mix till smooth, adding more milk if necessary to make a spreadable filling. 7) Divide the cooled layers in half horizontally, to make four layers. Place one layer on a serving plate, and spread with filling. Repeat with the next two layers. Top with the final cake layer. 8) To make the icing: Combine the chocolate chips, cream, and corn syrup in a microwave-safe measuring cup. Microwave till the cream is very hot, and the chips are soft. 9) Stir till the chips melt, and the mixture is smooth. 10) Spread the icing atop the cake, letting it drizzle down the sides. 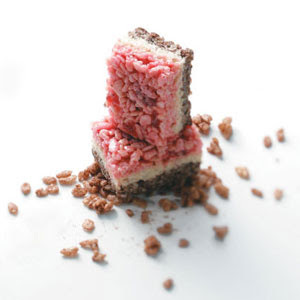 11) Serve in thin slices; the cake is very rich. 12) Yield: one 8" layer cake, about 12 to 16 servings. I'll admit it, I'm officially addicted to food blogs. But this tends to be a good thing, I have come across so many wonderful recipes. I found this one on Baker's Banter and they have become a family favorite. They are a ton of fun to make with the kids! Preheat oven to 375 degrees; lightly grease two baking sheets. To make the dough: In a medium-sized bowl, whisk together the flour, cocoa, baking soda and salt. In another medium-sized mixing bowl, beat together the sugars, butter, and peanut butter until light and fluffy. Add the vanilla and the egg, beating to combine, then stir in the dry ingredients, blending well. 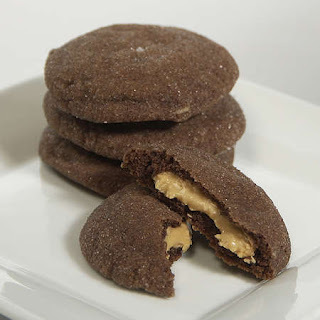 To make the filling: In a small bowl, stir together the peanut butter and confectioners' sugar until smooth. With floured hands or a teaspoon scoop, roll the filling into 26 one-inch balls. To shape the cookies: Scoop 1 tablespoon of the dough (a lump about the size of a walnut), make an indentation in the center with your finger and place one of the peanut butter balls into the indentation. Bring the cookie dough up and over the filling, pressing the edges together cover the center; roll the cookie in the palms of your hand to smooth it out. Repeat with the remaining dough and filling. Roll each rounded cookie in granulated sugar, and place on the prepared baking sheets, leaving about 2 inches between cookies. 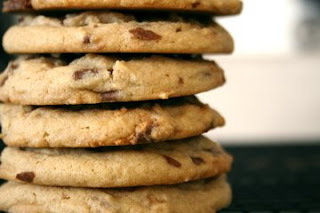 Grease the bottom of a drinking glass, and use it to flatten each cookie to about 1/2-inch thick. Bake the cookies for 7 to 9 minutes, or until they're set and you can smell chocolate. Remove them from the oven, and cool on a rack. Interesting, very interesting. WARNING: if you are not an egg eater, this recipe probably isn't for you. 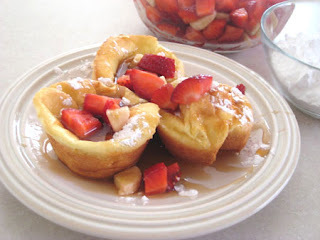 I found this out the hard way, I made these for breakfast and my poor husband took a bite, one bite - that was it! He has a great dislike for eggs, unless they are in cookies, brownies or cakes... I tend to agree... but these little yummies are well, YUMMY! Load them up with your favorite fruit, whipped topping, maple syrup and powdered sugar and you'll have a breakfast fit to please. My kids loved watching them "pop up" in the oven. Pretty fun cooking! Preheat oven to 400 degrees. Combine all ingredients in a blender, and blend until smooth. Pour into extremely well greased muffin tins (makes 24). Bake for 15 minutes or until golden brown - "pop" them out of the tins, and top as desired. Now, with all the coupon clipping I just did and the 18 jars of pasta sauce I got, I knew I would need a yummy recipe to use up the sauce. You can do this with either store bought biscuits or homemade bread. I was in a pinch, so I used buttermilk biscuits and I really don't think I would do that again. 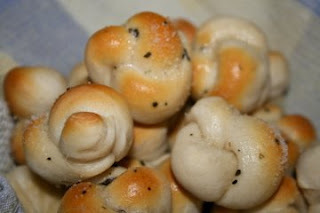 Just use the Parmesan Breadtwist Recipe. Cut your biscuits in half and roll into a 3" long rope, tie in a knot. Repeat with remaining biscuits. Bake at 400 degrees for 8-10 minutes or until golden brown. Combine melted butter and Italian Seasoning, spread over warm biscuits; sprinkle with parmesan cheese. Note: you can also add garlic salt and parsley flakes to the butter mixture. I recently came across this recipe and knew I just had to give it a try! While making these, I found I had no chocolate chips - thanks to a very helpful neighbor (hi heidi d.) I was able to complete this wonderful recipe. This is a kid-friendly recipe, just be sure to have an adult help at the stovetop. In a large saucepan, combine a third of the marshmallows (about 2 cups or 18 mallows) and 1 tablespoon butter. Cook and stir over medium-low heat until melted. Remove from the heat; stir in chocolate-flavored cereal and chocolate chips. Press into a greased 8x8 dish. In a large saucepan, combine a third of the marshmallows and 1 tablespoon butter. Cook and stir over medium-low heat until melted. Remove from the heat; stir in 2 cups rice cereal. Press into dish over chocolate layer. In a large saucepan, combine remaining marshmallows and butter. Cook and stir over medium-low heat until melted. Remove from the heat; stir in preserves and food coloring. Stir in remaining cereal. Press into the dish. Cool. Cut into bars. Yield: 1 dozen. I didn't use the food coloring, because I was all out, but I would highly recommend using it for presentation purposes. It makes it a richer red color, the preserves just don't give it a good coloring. Combine eggs, water and milk in blender for 10 seconds. Add flour, cocoa, sugar, salt and butter; blend until smooth. Spray 5 to 6 inch skillet (or crepe pan) with cooking spray, heat over medium heat. For each crepe, pour 2-3 tbsp batter into pan; lift and tilt pan to spread batter. Return to heat; cook until surface begins to dry. Loosen crepe around edges, turn and lightly cook other side. 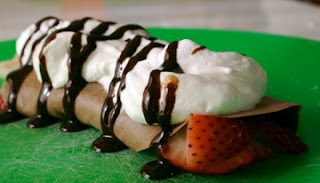 Filling options: fresh fruit, pie fillings, whipped cream, yogurt, powdered sugar, chocolate syrup. And then, honestly, I had to find this recipe too! Preheat oven to 350. Beat butter, sugar and peanut butter in medium bowl until creamy. Add egg and vanilla; beat well. Stir together flour, baking soda and salt. Add to butter mixture, stir by hand. Stir in cut up peanut butter cups gently. Place by scoopfuls onto lightly greased baking sheet (these cookies spread a little, so don't put them too close). Bake for 11-13 minutes.